France, with its long history of conflicts between monarchs and knights, and of course the English, has left us with a glorious legacy of fortified cities. And many of these still have much, if not all, of the original ramparts complete with proud towers and massive gateways. Some of them now have hotels built into the walls, so you can dream your medieval dream as you fall asleep to the sounds of footsteps in the cobbled streets below. Romantic? Yes, impossibly so. Aigues-Mortes translates as the rather sinister ‘Dead Waters’ and it’s had its fair share of horrors. Climb the Tour de Constance where Protestant Hugenot women were imprisoned after 1685. Spare a thought for Marie Durand who entered the tower as a young woman and left as an old one 38 years later. From here you can see the endless salt flats that stretch into the distant misty world of the Camargue where cowboys rule. Aigues-Mortes was built as a fortress port by Louis IX in the 13th century before he set off on the Seventh Crusade to the Holy Land. Stay at Les Arcades, a renovated hotel in a 16th-century building tucked into the walls. Avignon was the capital of the Catholic church in the Middle Ages, where a city within a city commanded the whole of Christendom. Today the fortified medieval walls that protected the papacy still surround the old center. Avignon is a wonderful city to visit, a chic place with good restaurants and hotels. You can walk around some of the medieval walls and look out onto the other great site of Avignon, the bridge that spans half the river. Avignon is a UNESCO World Heritage Site; watch some of the history of the famous Pope’s Palace at the spectacular sound and light show that takes place most summer evenings in the Palace Courtyard. If you’re a bed and breakfast fan, stay at Le Clos de Rempart, an old 19th-century house converted into a comfortable b&b near the Pope’s Palace. Read guest reviews, compare prices and book Le Clos de Rempart on TripAdvisor. 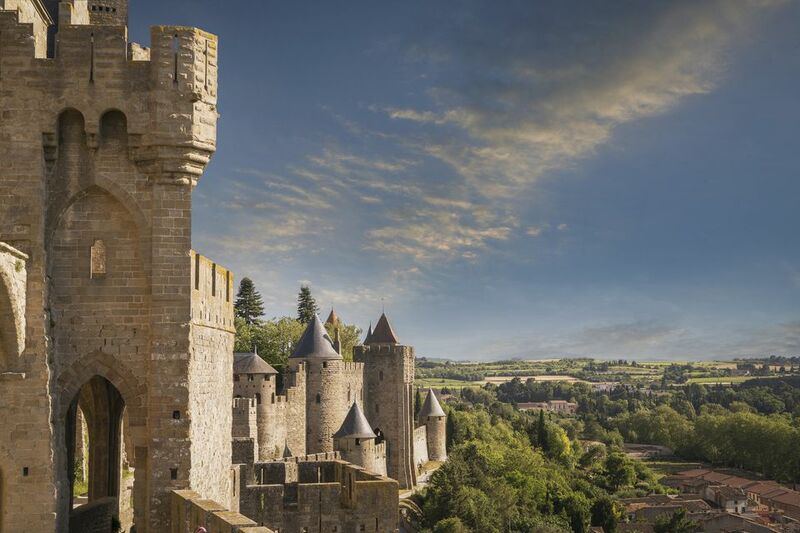 Carcassonne is the best known fortified medieval city in France, and with good reason. Not only does it have more than its fair share of history – this was the major city for the heretical Cathars in the 13th century until it was captured by the ruthless Simon de Montfort in 1209. The heretical movement lasted until 1244 when the Cathars made their final stand against the powerful established French church at Montségur. The walls of Carcassonne which surround the whole of the old town can be seen for miles. It's a spectacular place and very crowded in summer when thousands flock to this UNESCO World Heritage Site. If you’re feeling flush, stay at De la Cité, a luxury hotel in a former medieval manor house. Laon in the Aisne department of north France is another undiscovered gem well worth seeking out. Like all the major fortified cities, it stands high up on a narrow ridge. Looking out to the plains of Picardy and Champagne, the city and the countryside is dominated by one of the finest gothic cathedrals in France. Built in the second half of the 12th century, it was the cathedral that introduced many of the features so extensively used subsequently. Great towers and the arcaded galleries above the west front became the pattern book for Chartres, Reims and Notre-Dame in Paris. It’s a lovely small city to wander around, discovering little passages off the main street that lead to the walls where gardens lend a splash of color. Look out for the small statues in niches on the walls. Stay at La Maison des 3 Rois, a delightful bed and breakfast with wooden floors and tiled bathrooms. Langres looks out over the Marne, its defensive walls still mainly intact. Walk along the ramparts past 12 towers and 7 gateways, then take to the little medieval streets within the walls. Langres was a rich town, strategically located on the great trade routes between Rome, England, and Germany. Langres was the birthplace of the Denis Diderot, best known for his Encyclopaedia. A statue of the great figure of the Enlightenment stands in the main square, looking pointedly away from the cathedral. Stay at the Cheval Blanc, a former inn that is now a supremely comfortable small hotel just off the main street. La Rochelle, known as the White City (La Ville Blanche) sits on the Atlantic west French coast. Once vital to the kingdom of France as one of the strategic ports along the Atlantic coast, it’s a gracious, elegant city. Not a huge amount is left of the original defences but the entrance to the old port with its two towers straddling the mouth of the harbor is a well-known site. Old city walls dwarf the little streets below. If you’re here, travel a little further to the delightful port city of Rochefort for a glimpse of the beautifully reconstructed ship, L’Hermione. Stay at the Best Western Champlain France Angleterre, a lovely old mansion full of antiques and just near the port. Impossibly romantic Saint-Malo is surrounded by grey granite battlements that hold back the roaring sea from the old citadel. Once a fortified island at the mouth of the river Rance, today it’s a lively city with huge sandy beaches and more restaurants inside the walls than is good for the wallet. You can walk along the ramparts, braving the winds gusting off the ocean, and admire the seemingly genuine old buildings within the walls. In fact, the whole of this part was beautifully reconstructed after massive destruction by the bombardment by the Allies against the Germans in 1944. Quite apart from its obvious attractions, St-Malo is beloved by Brits traveling on Brittany Ferries from the UK to Brittany, Normandy and West France. You can use it, as I did, as one end of a journey taking you down the west coast, through the Pays de la Loire and cities like gracious Saumur, to the Dordogne, Bordeaux, Biarritz and the coast of Spain. Book at the delightful Quic en Groigne by the citadel. It’s a small, friendly hotel with good rooms. Read guest reviews, compare prices and book Quic en Groigne with TripAdvisor.